← DG, CPWD issued Meeting Notice in response of CPWD EA letter Dated 13/10/2015. 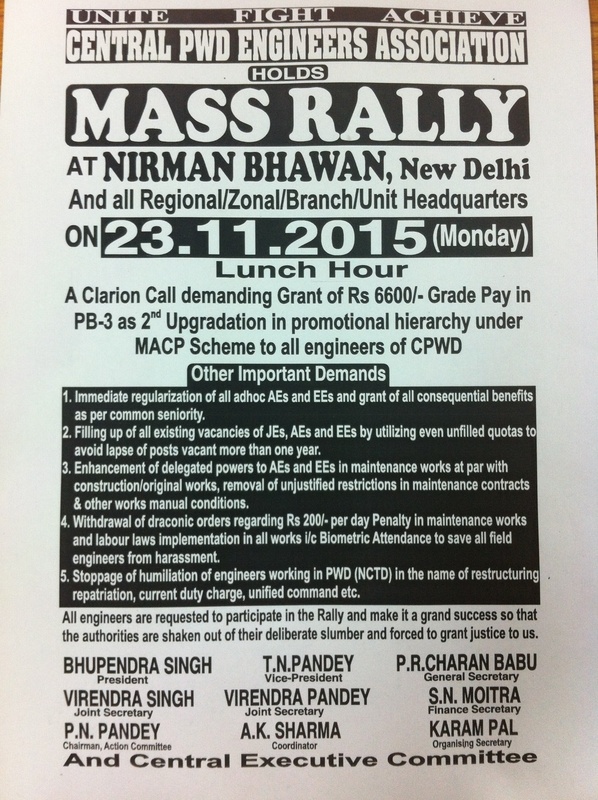 Mass Rally at Nirman Bhawan on 23rd November 2015. All Promotes Engineers of our cadre are requested please come out from your offices leaving all other work on 23rd Nov and made this rally grand successful not only for current deprived engineers of our generation but also for engineers joining department in coming year. leave the differances for one day atleast and take pledge to ensure grand rally for junior brothers so that we may progress further with great energy and enthusiasm to achieve our legitimate demand of GP 6600/. & other burning issues. Posted on Mon, Nov 16th, 2015, in What's new. Bookmark the permalink. 1 Comment.